Aion dps/ap meter. Developed by Hikari (EU server Deyla/Stormwing, elyos). Added a “player database” feature. Little tool to keep track of players; you can add them from their player box or through the management tool under Tools/Player Database. You can pick between 4 “scores”: blacklist, bad, neutral, good, which will show in different colors. 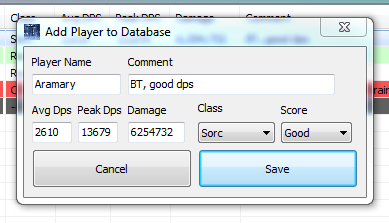 You can access the tool also in-game with the comand “.db”. In-game commands changed: .ap .dmg .bb .gg .tr .si .rank .kill .ss .css .uss .clear – check Help/Tips for a complete list of available commands. Added commands to show siege times, ranks table, kill aion process. Added a warning on the main window when the chatlog file exceeds 200 MB. If you click it, a window pops up with options to automatically delete the file or rename it with the current date as pattern, and automatically kill Aion process before (required). Added always-on-top option to Damage Profiler tool. 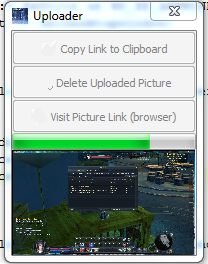 Clipboard copy commands (dps/ap) are now trimmed to 255 characters (Aion limit -.-). Added “MouseMove” on Damage Profiler tool (move the window by dragging it from anywhere besides the caption bar). Fixed MouseMove on the main ARM window (it didnt work on certain areas). Added a popup menu when you right-click the b/g text for +/-/reset. Loot History window now keeps track of all looted items. Manually added ones with .bb/.gg are split into another box. Added recognition for promise/blessing of wind hits for cleric/chanter, but only for self-hits (others wont register the hit). Dettached the chat from the main window. It’s automatically docked, but you can undock it and freely move/resize it separately. Player names will change color when actively dpsing, from green (dpsing) to light blue (dpsing some seconds ago) back to white (idle). Improved detection of non-player hits to exclude from players list (mob names and such). 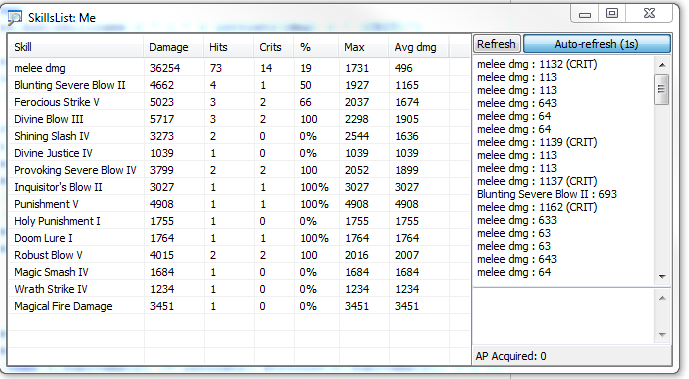 Added a setting to show hits from mobs (not permanent). (this is useful f.e to test the dmg mobs do on you with different gear etc). Fixed: some pvp hits from the other faction or duels now register properly. (not sure if all, needs further testing). Reflect shield hits will now register to yourself properly (a separate player was added before). Skills window now has 2 buttons to refresh the table, and to auto-refresh every second. Added crit % rate and average damage per skill to skills list window. 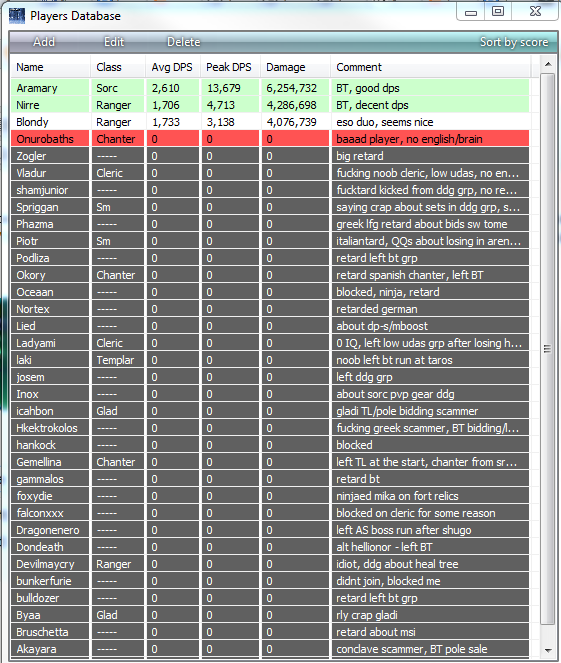 Added a display bar for all dmg/dps (damage from everyone together); it shows current dps – average dps – peak dps – max dps – damage. Added commands and menu options to take and upload Aion and damage screenshots; they are saved in PNG (as opposed to Jpeg by Aion client which lose some quality). Uploaded ones are Jpeg though instead, to save on upload time. Windows will now “snap” to the edges as you approach them when dragging. Added a popup menu to the player displays with options to bring up skills window, copy damage data, remove/ban from parsing. 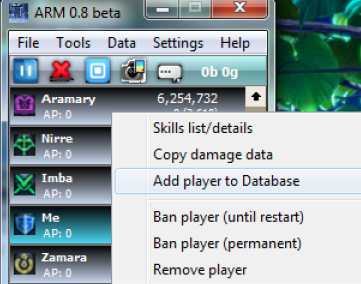 Added player removal/ban. You can now remove single players from the main window without clearing them all. You can also ban player names from being parsed, either temporarily (until you restart) or permanently. You can edit the banned names in Settings/Edit banned players. 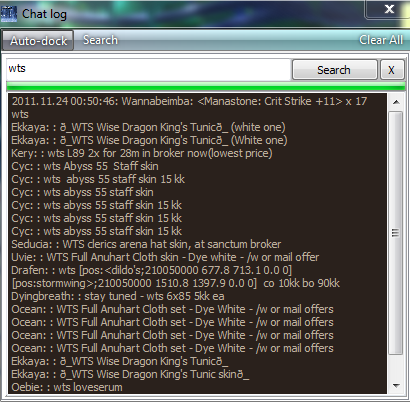 Added search/filter option on the chat window. Added a screenshot button to the main window. – Improve UI. Alternate UI. – Complete sm pets skills testing. Added asmo 2K DP pet recognition. – Remove siege mode and generate queues for cleric servants cast on the same mob. – Add a setting to parse only group or ally members. – Add a display with more data when you click on a player box. – Hide AP display when not in use. I’ve been getting a few emails requesting translation of my parser to other languages like french, german, spanish.. so this is a general reply for future reference. I don’t like nor believe in localisation for software and media, and believe everything should remain in English before wasting time and resources into unnecessarily translating into other languages. Therefore, the parser will remain in English and I won’t be making any translation options available. If you are having issues due to using the german or french clients, I suggest you use the english one, you can still connect to any European server with that one afaik. The only thing I’d consider is an option/setting for the Korean and Japanese clients (the app would still be in English, but would support korean and japanese game logs for parsing).